A film directed by Alastair Fothergill and Mark Linfield. 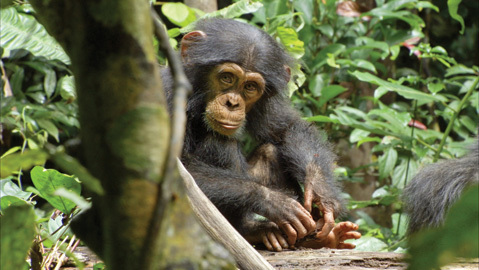 Disneynature’s documentary <em>Chimpanzee</em> chronicles the travails of 3-year-old chimp Oscar. Folks of a certain age will remember hunkering down before The Wonderful World of Disney on Sunday nights, projecting a collective grandfatherly persona on Walt Disney, our tour guide to humble nature-film tidbits. In some way, seminal shows such as that whetted young appetites to know the world beyond cozy American or human-centric realities. Fast-forward to the vastly more evolved and adventurous nature film culture, and the folks at Disneynature, working with the Jane Goodall Institute, have helped put the impressive and uncommonly animal-kingdom–sensitive Chimpanzee into theaters everywhere. One upshot: Our young protagonist, Oscar the chimpanzee, is one of the more lovable and endearing big-screen characters of the year. Not only is Chimpanzee beautifully shot — in Ivory Coast and Uganda over three years — and ambitiously integrated into the secret society and world of chimpanzees, but the filmmakers’ efforts were rewarded with that kind of serendipitous “plot” turn of which documentary filmmakers dream. Mild plot spoiler alert: Amid the warring factions and fracases of territorial chimpanzees, Oscar becomes an orphan (speaking of Disneyana, can you say Bambi?) but is taken under the wing and virtually adopted by the chief male of the pack, a rare occurrence in the wild, let alone laid out for cameras to capture. Narrator-wise, Tim Allen is our surrogate for the avuncular Walt, and a bit annoying at times, with a winking text heavy on the anthropomorphizing of animal life. But it’s no matter. What we get from Chimpanzee is a powerful, and, of course, highly edited taste of planetary life in a jungle far removed from our own.